[yes I know that Peter Lyon didn't make the commercial versions, my question is why would UC copy the originals and then make the commercial versions with rat-tails? 2) what's the point of having a rat-tail? Would it make any real difference to cost? Bill - does the Glamdring tang go the entire length of the hilt? Thanks. Yes, it did go all the way through, and the pommel screwed on. Granted, I saw this about two years ago, but considering that UC would have little incentive to try to improve the "functionality" of a decorative sword, I think it's safe to say it probably hasn't changed. If you want a more reasonably priced fantasy sword, you really should check out www.museumreplicas.com for less expensive options. They tend to be within the same price range of the UC wallhangers, but are made to be more along the lines of a true sword. Granted, they've got their issues (you get what you pay for), but it's certainly a much better place to start as a beginning collector than going all out custom when you don't know exactly what you want yet. Joe - in no way were my comments meant as a slight against your sword. Just a personal preference. But the more I look at the sword, the more I like it. I may decide to get it yet - I'll have to think about it, I just hope the price is negotiable. One thing though - what is the POB of this sword, and how does it wield? After reading so many reviews, i think I want my first real sword to wield pretty quick. Joel - that Albion sword is amazing. The problem is, and with most real swords is - when they look "fantastic" they often cost over $2000 and there's no way I'm going to shell out that money. As for the Edward III sword - it doesn't look fantasy to me, in fact it looks like a typical English medieval sword - too "ordinary". As for Peter Lyons - no doubt he made the originals as real swords, what gets me is - WHY make the reproductions with a rat-tail tang? Surely the difference in price between a full tang and a rat-tail mustn't be that great!! I did not take it as a slight in way. The point I wanted to make, is that you should get something you like and can afford. If you really get into collecting, you'll grow into more expensive tastes in time. The other thing to remember is that as much as you like one thing today, you'll be sure to like something else tomorrow! Never mind my post. There are many folks here that are much more knowledgable than I am and can say it better. Still I do enjoy coming here and electronically sitting at the feet of the masters. Ha, masters? You give us too much credit, Pamela! Glad to see you posting here, though! Joe - just for the heck of talking, let me tell you what I think of your sword. Just by the photos, I can tell that your sword is clearly superbly made, and it appears better made than the AT. However, I personally don't like the wooden handle, as it reminds me too much of kitchen knives. Also I like the blood groove (is that what it's called?) in the AT sword. Overall the AT sword "appears" more fantasy like - and appears more like the LOTR swords, which I like very much. Your sword certainly looks more authentic for sure as far as historical accuracy is concerned. Of course, these are just the opinions of someone untrained at such things. I'm trying to recapture my childhood, which did have fantasy beginnings, so that influences choice greatly. Your sword would definitely be more ideal for someone capturing a more authentic mood. I'm really thankful to all who replied to this thread, because I learnt almost a life time of knowledge on swords (compared with most people) in just 2 days. which lists them as "light contact use only". I guess what also makes them scary is most of them don't give a manufacturer which should already set alarm bells off. And yes, I do know what I'm looking for - something that could pass as a fantasy sword, but has the handling characteristics of a real sword, and something that doesn't cost an arm and a leg. I don't want to go half way with the authentic handling - what's the difference between getting a half real sword, as opposed to a wall hanger? I know what you want. A sword from John Lundemo at Odinblades. It's probably going to be more expensive than you want but you get what you pay for. If you're quality consious that's where you'll end up anyway. Do a search at Swordforum.com for "John Lundemo" or "Odinblades" and you'll turn up some pretty amazing stuff. When it comes to LOTR:esque swords John's swords are as good as you're going to get. The point of my post was that most of the "fantasy" swords you are talking about, i.e. the LOTR swords, are really historically based blades with custom hilt components (Glamdring and the Elvish blades are teh exception). The point of my post was that you cna buy a blade you like and as you get the money, you can get customized hilt components made just for you. What I am seeing in this thread, sadly enough, is something that stared out as a promising topic, but has just turned into a general argument by the thread-starter on everything anyone offers. This is my last post on this topic. Also I like the blood groove (is that what it's called?) in the AT sword. That's actually called a "fuller"
"Every normal man must be tempted at times to spit upon his hands, hoist the black flag, and begin slitting throats. Been reading this thread with interest and now I'll throw in my 2 cents worth. I have 8 of the UC LOTR swords hanging on the walls of my basement (which has been dubbed "The Ring Room"). My wife & son are huge Tolkien fans and these are just extention of that. About the only one out of the bunch that I would even dare swing around would be Arawen's Elven sword. It doesn't have a rat-tail tang, as the blade & tang are all one piece. It's heavy as heck,not balanced, but a (IMO) pretty blade. Heck, to even quench my curiousity, when I first got the Arawen, I took it out and cut a melon in half with it (clean as a whistle) but then promptly cleaned it and returned it to the stand. Not the smartest thing to do, I know, but just had to know. You've been given many great recommendations to excellent functional swords that are available,so if I may, suggestion another. Armour Class of Scotland. They produce good quality, functional, historical replicas, at a fair price. Check out my review from this month on my mortuary hilt I purchased from them. You have surely came to the right place for your questions. This site is a pure joy to all. I leave here more informed with every visit. As said before, everybody's taste are different. Just be happy with whatever direction of collecting you take, 'cause once bitten by the bug, there is no turning back. James - what about Viking Metal Works? the products look pretty well made to me. Does anyone have any experience with these swords? I'm glad you asked - here's the long answer. I love the work Glen has done for me. That pattern-welded Norse sword you see on the 'swords' page is mine. It's based on a beautiful short sword design that Kevin Cashen came up with for one of his award winning blades - I loved the idea of a Viking-style short sword with the slim ricasso, but wanted Glen to do something really crazy with the pattern. I was deeply impressed with what he came up with, and I've yet to see a blade with a random pattern quite like it. Beautiful lines, tight fittings; and he always kept me updated on the sword's progress. Really tough little sword, and it has this sense of ruggedness that befits its Nordic inspiration. The same goes for the customised version of the Filmore rapier that Glen made me - unlike the Viking piece, the rapier on Glen's site is not mine - I had my hilt done in bone and bronze. Beautiful work, great communication, and incredible value for money; especially back then when his prices were lower - my swords were made about four years ago. However...I'm afraid to say that Glen has been out of communication with his current clients for some time now, and most of them are in doubt as to whether they'll ever see their swords. I have no idea what might be up with Glen and I won't speculate. I will say that the Glen Parrell I know was not the kind of guy to take his customers' money and run; but the facts we have are pretty damning. I hope that Glen resurfaces soon with a satisfactory explanation, but until he does I will echo the advice of others and caution you - and any one else - not to commission a sword from Viking Metal Works. That said, I doubt you'd get a response to any inquiries to begin with - I haven't heard of Glen contacting anyone recently, whether to take orders or explain them. I agree with Kenneth's recommendation to contact John Lundemo of OdinBlades.com. John has many, many satisfied customers singing his praises on Sword Forum; and has done a lot of LotR-inspired fantasy work for his clients. I would also highly recommend Al Massey, who made this stunning, feather-light leafblade for me. It's currently back in England with the rest of my collection, and I miss it like a limb. This is the best sword I have ever handled, bar none; and the favourite piece in my collection. I'm currently on Al's list for a 'sibling' sword, this time with light hilt fittings as opposed to the dark ones on this piece, and a pattern-welded blade. I cannot wait to see what he comes up with. He is a wonderful smith to work with, and his blades speak for themselves - he makes rugged, functional swords; and his fantasy work has that indescribable sense of the mythic that lends it a sincerity often lacking in these types of design. Regardless of which route you take - custom, semi-custom, production - I wish you the best of luck in finding the sword that meets your needs! And Joel is right: Most of the LOTR swords, while not historically accurate, are reasonably historically plausable, which is what makes them such good looking swords, IMO. They don't have ridiculous spikes and claws, they instead look like real weapons that really function. Oh, BTW, you'd mentioned earlier a sword looking heavier: Don't fall into that trap. There's a lot more about what goes into making a sword light than it's relative size. Since nobody has posted a visual pic of what a rat-tail tang looks like, I thought I might throw this out here. Then you have answered the question of what one is right for you now. As with everything else, wood or leather is a personal preference. Normally A&A does leather grips and in older days Atrim mostly did wooden ones. Obviously things change as time goes by. In the case of this sword, we went with wood so it would be different. ?? I am puzzled by your response. I don't see how you could have concluded that I am just starting arguments and picking fights with everyone. All I'm doing is learning some fantastic information from everyone, and also gabbing away my 2c worth now and again. I have in no way insisted I was right on any point I have raised - why would I since I admit several times that I know nothing about the subject? By the way - the advice you give is very good advice. thanks for that. I had seen the swords before, but I'm too afraid to ask how much they would cost. Amazing swords - and you're right - they are kind of what I'm looking for. how much are they by the way? thank you for the tip about Al Massey. I see he lives in Nova Scotia, which would hopefully be most convenient for me. May I ask how much a sword like that would cost? thanks for that illustration. the difference is amazing. Why anyone would want to build a rat-tail tang is beyond me, that thing looks pathetic! Oh, I'm really upset now! That middle blade is obviously the UC Glamdring!!! thanks for your insight Joe. Let me give you a little history about me. Like I mentioned before, I'm really into fine watches, which really follow the same kind of philosophy as swords as far as fine craftmanship is concerned. I've been participating on watch forums for over 6 years. In that time, you quickly learn just how much junk watches there out there like Fossil, Guess etc., and what are the good quality affordable watches like Seiko. I guess if you were to equate watches to swords, an ATrim would be equivalent to a Seiko, UC swords would be like a Guess and so on. Anyway, the point is - the more you learn about watches, the more you appreciate the art and finery that goes into a hand-crafted mechanical watches as opposed to the cheap battery powered quartz watches. The more I read here - the more inclined I am to get a more authentic sword. I am being more assimilated into you guys! Arghh.. as if I haven't got enough distractions in my life! Mind you, I'm not being double-minded about the childhood fantasy reminiscence thing - it's just that my perception of what might constitute a fantasy sword has drastically changed. I guess besides being magical, a magical sword would be made to the highest degree of physical sophistication, with great attention paid to POB, weight, strength and so on. In other words - if I were to hold one of the more funky looking "fantasy" swords that didn't feel right in the hand, I'm no longer going to believe that it feels "magical" because a highly engineered sword should feel amazing in hand. The craftmanship and science of swords fascinate me to no end. I am so glad to have learnt so much from you guys!! 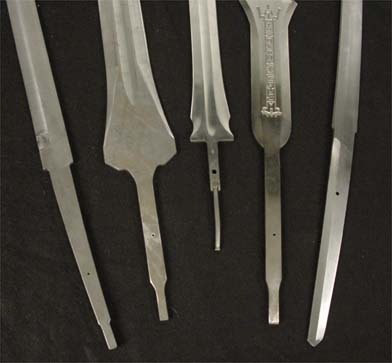 The price for a custom sword can vary a lot depending on the finish and decorations. It's best to ask the smith.